PLACE pizza crust on baking sheet. Arrange tomatoes over crust; brush with 1 Tbsp. dressing. HEAT remaining dressing in large skillet on medium-high heat. Add zucchini and yellow squash; cook and stir 4 to 5 min. or until crisp-tender. Arrange over tomatoes; top with cheeses. BAKE 10 to 12 min. or until crust is golden brown and mozzarella is melted. Sprinkle with basil. 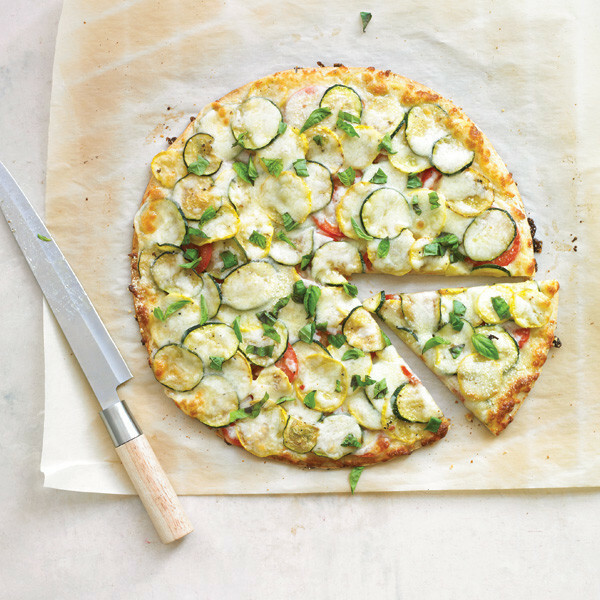 Prepare using 4 small plum tomatoes and/or 2 zucchini instead of the combination of zucchini and yellow squash. Prep Time: 20 min. | Total Time: 32 min. Per Serving: 290 calories, 13g total fat, 5g saturated fat, 25mg cholesterol, 630mg sodium, 29g carbohydrate, 1g dietary fiber, 2g sugars, 14g protein, 15%DV vitamin A, 10%DV vitamin C, 30%DV calcium, 6%DV iron. Omit baking sheet and bake pizza directly on oven rack. Squash mixture may be cooked, cooled and frozen up to 2 months. Thaw and drain before using to assemble pizza. Serve with a mixed green salad and your favorite fresh fruit to round out the meal! Be the first to rate & review this recipe!